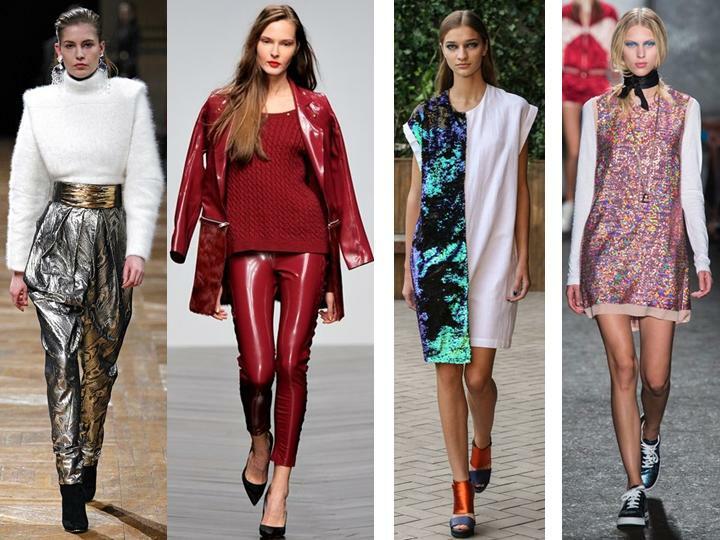 From pearly sequins to patent plastic and latex, shiny textures and fabrics are on the cards across the seasons. Across collections from Paris, London and New York fashion weeks the shine was dominant. The revival of the plastic mac was evident on Autumn ’13 collection catwalks at London Fashion Week, with Felder Felder combining plastic macs with latex. Mermaid pearly fabric shades and sequin tones could be seen in the Marc Jacobs and Rodebjer Spring Summer ’14 collections at New York Fashion week. Leathers were displayed with sheen, and gilt gold and silver pants were paired with fluffy sweaters to balance them out in the Balmain show . One thing’s for sure, this trend is as much an exploration of fabrics and textures as it is a treat for the senses. Left to right: Balmain, Felder Felder, Rodebjer & Marc by Marc Jacobs.